An aerial of Blue Mesa Dam and Reservoir. A Colorado River Drought Contingency Plan Authorization Act speeded through Congress, with U.S. Rep. Scott Tipton cosponsoring the House version and U.S. Sens. Michael Bennet and Cory Gardner introducing legislation in the Senate. The act, which cleared the Senate Monday, directs the U.S. Department of the Interior to implement the drought contingency plan that seven states in the Colorado River Basin spent years crafting. Colorado, New Mexico, Utah and Wyoming are the Upper Basin States, whose water is stored in Lake Powell. Lower Basin States are California, Nevada and Arizona; their water is stored in Lake Mead. All states, and Mexico, are part of the 1922 Colorado River Compact, which governs the division of the river’s water between the states. The drought contingency plan is a formal strategy to maintain levels at Powell and Mead in the face of dry conditions. “We’re optimistic the president will sign this. This is an important step to making sure the Lower Basin is addressing its historic overuse,” said Zane Kessler, communications manager for the Colorado River District. If the act becomes law, Colorado and the other Upper Basin states can begin the process of rebuilding their “savings account” in Lake Powell and addressing supply-side issues, he said. “Ultimately, we’re excited to see the process moving forward,” Kessler said. Significant, ongoing drought, coupled with soaring population growth, has imperiled storage levels at the reservoirs, as well as the hydroelectric generated at Powell. Under the drought contingency plan, the Lower Basin states have agreed to a specific schedule of curtailments, or shortages, when levels at Mead reach certain points. 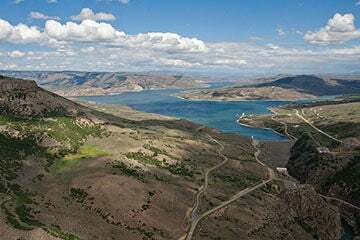 Colorado and the other Upper Basin states have agreed to a multi-pronged approach that includes increased cloud-seeding and more tamarisk eradication. Another component is using Blue Mesa, Navajo and Flaming Gorge reservoirs to send water to Powell when drought conditions demand it. Colorado and the other Upper Basin states have to determine how much water can be sent from those reservoirs if the drought contingency plan has to be enacted. They must also make plans for demand-management, or reducing water use so that what is conserved can be sent on to Powell to keep hydro-generation going. The Colorado River District favors voluntary, compensated and temporary demand-management, should curtailment ever be required. The Colorado Water Conservation Board, with input from the river district and others, is to build the demand-management plan for Colorado. Kessler said that process will entail “robust” public outreach and stakeholder involvement concerning if and when it would be appropriate to use Upper Basin storage to help preserve levels at Powell. “We don’t anticipate that will come immediately, but that tool will be at our disposal once this bill becomes law,” Kessler said. Colorado’s congressional leadership, in provided statements, hailed the drought contingency plan and accompanying legislation. “Following a historic, two-decade-long drought in the Southwest, I am glad to see an effective strategy produced after years of collaboration between the seven states involved and the federal government,” said Tipton, who cosponsored the House bill. Gardner and Bennet introduced the Colorado River Drought Contingency Plan Authorization Act in the Senate on April 2. Gardner said 40 million people in the West depend on the Colorado River, as does a growing recreation economy. He praised the Upper and Lower Basin states for creating coordinated plans that would kick in to prevent severe water shortages and stabilize storage levels at Powell and Mead.